While leading your life and your family or your team, once in a while it is good to take risks. Especially if you are very young and starting a career or if you are going through your mid life crisis. The rewards will slowly come if you are patient. Few risks you must take, I truely suggest. 1. Quitting or taking a break from a job that you don’t love. 2. Going in that direction when your heart points towards a dream that keeps you awake at times, take some actions in direction of that dream. 3. If you love someone, tell the person so with no expectation of favourable or unfavourable response. 4. Trusting people in your life more than you trust yourself. Especially your family members. Going beyond the games and really caring from your heart and dropping judgements. 5. 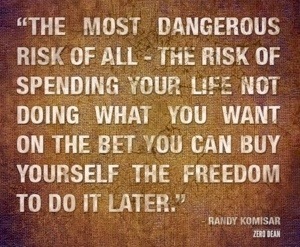 The most difficult risk which you must take. Love yourself, unconditionally. While you take these risks, keep the following in mind. 5. Say i love you to yourself and those around you regularly. Some prayers are best done everyday. Make expressing love as your heartfelt prayer. Take this last risk, and you never know you might stumble upon an easy going, blissful life. Doing what you love to do and building a great family and community with some selected fellow walkers. Life is joyful. Let go and learn to enjoy. The biggest exhilaration comes with risking for something for collective good. It will help you lead a powerful and meaningful life. But above all whether you win or loose, dont loose your heart. Hold everything lightly and never take yourself seriously 😉 Tension lene ka naai, aur deneka bhi nai. Majje main reheneka.